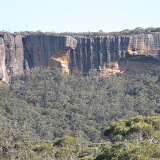 The original intention for this walk was to follow a long used track starting at the Endrick River entrance on the western side of the Budawangs area of Morton National Park. However, this entailed crossing private property and the owner has recently blocked access. So an alternative from the same starting spot was taken, via the Alum Track. It is written up in a guidebook and although part was marked on the map as a route; I assumed that plenty of walkers would have gone this way and a reasonably easy to follow pad, possibly with markers would be there. No sign of a pad existed when we reached the Flat Top Mountain area, so we followed the notes to the top where the view down to Running Creek was enough to cause serious doubts about heading to an area of several creek crossing with unknown scrub. The guide book did mention open sections, but they have either overgrown or we could not locate them; except for a very short wet one. The scrub at the creeks was thick and slowed our progress down even more. Several heathy sections were easy enough to negotiate by weaving through the most open bits. Fortunately when we reached the Square Top Track it was not long before we reached an upper tributary of Running Creek that was living up to the name. A nice clearing was close by too, so we were able to set up camp and cook before dark set in. It was over 2.5 k to the junction with main track near the Foster Mountain turnoff. 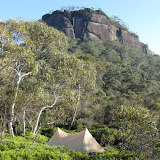 We climbed Foster, where we got the first views of the cliffs of the mountains of the Budawangs. The previous day was mostly fine, except when a period of showers arrived during the afternoon, but today and the next two were delightfully sunny and mild. Back on the track it became narrow and at times there was a bit of scrub ducking and weaving, plus a couple of scrubby creek crossing. For most of the afternoon we were out on plains with a number of tree belts and the views were superb. The cliffs of Mount Hoddle were impressive with huge cave like chunks within them, whist Quiltys and Sturgiss Mountains were equally dramatic. The campsites at Styles Creek were described as a bit degraded, but perhaps they now get less use, for they seemed in good order. Perhaps this and time may have healed things. The track from there north was better than what we had been on the previous day, until we encountered lots of fallen trees. Hidden Valley was the first diversion for the day and this was a track that wound a way through a gap in Sturgiss Mountain to a small valley surrounded by cliffs. Our notes indicated that a track should continue through to a clearing, but we found it took a while to find the last bit of pad and were unable to locate any clearing amongst the scrubby interior. On the other hand the pad to the aboriginal Bora ground on Quiltys Mountain was quite obvious and easy to follow. From here we also had views down the valley of the Kilpatrick Creek to Pigeon House Mountain and the huge buttresses of the mountains in that direction. A wide track through forest was followed through The Vines region to meet the first crossing of the Endrick River after which a suitable campsite was found. The final day was a three hour walk with an ever widening valley and plenty of flowers to the second crossing of the Endrick and then a short walk to the car. I hiked in the Budawangs once and become sort of lost-ish. Must return some day.